However, it is director Mariusz Trelinski’s vision of Hans Henze’s Boulevard Solitude, which itself is based on the story about Manon Lescaut, that gives us this stylised and clunky vision of female sexuality. WNO booked Trelinski and set designer Boris Kudlickato for both Puccini’s Manon Lescaut and Henze’s opera on the same subject. It is an interesting concept as it leads to a highly stylised set being used for both operas. That is about as good as it gets though as Trelinski has directed the hell out of this opera. 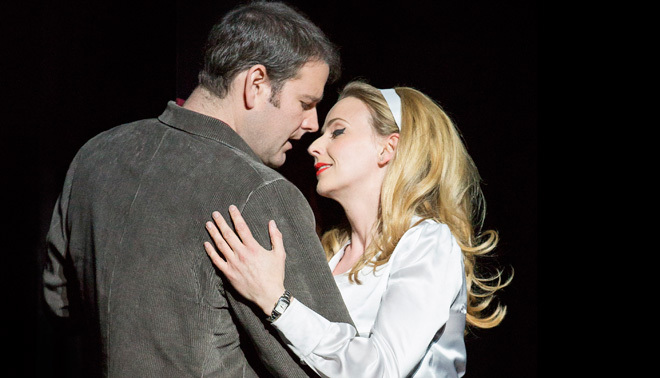 Sarah Tynan is a vision in the role of Manon and sings wonderfully as well, but is overwhelmed by the staging. We are greeted in the opening scene with Manon sitting on a sofa holding the gun with which she has shot her former lover Lilaque, Pere, ably sung by Adrian Thompson. This leads to the best part of the opera as police officers march across the stage in slow motion to arrest her and take photos of the crime scene. -style cops in Paris. This is a device the director used in his risible Manon Lescaut and adds little here. Tynan and Jason Bridges as Armand Des Grieux, her student lover, are wholly unconvincing in a relationship thwarted by her burning desire for material possessions – which can only be provided by a succession of porcinely rich lovers. This production buries why Armand and Manon are so in love. Stripped of a convincing love story we are left with the overt sexuality of a sluttily dressed Tynan and a drug-addled penniless student. The orchestra under the inspired baton of Conductor Lothar Koenigs bring Henze’s atonal score to vivid life, as does the occasionally inspired singing. But overall we are left with a production that does not equal the sum of its odd parts and leaves us feeling faintly nauseous at the bleak expression of mankind in its full decadent glory.